Of all the recipes we've tried from The Twelve Best Foods cookbook for our Best of 2011 Challenge, I think this one stands in first place. Okay, wait. I just remembered sweet potato butter, warm avocado salad, and last month's chocolate chile nuts. 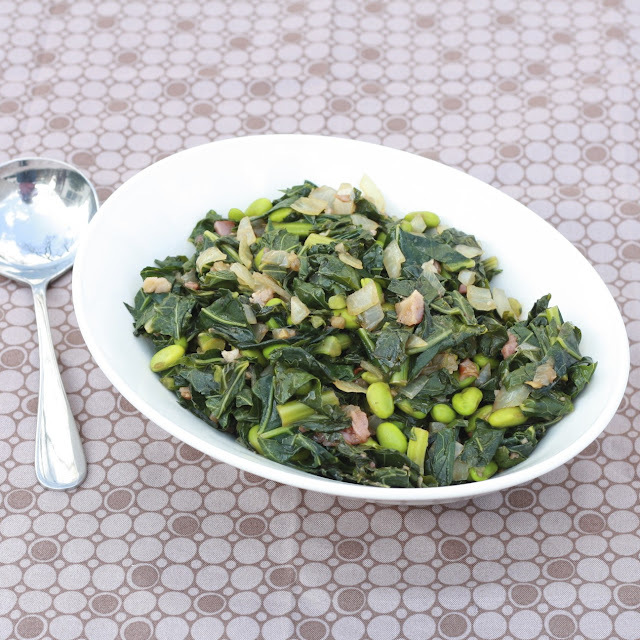 Overall the book has been a raging success...but this recipe for BBQ Collard Greens with Edamame definitely belongs near the top! To be honest, I was a little surprised that soy made the list. There are a lot of other foods I'd probably place before soy, but I'm not the author and so I went with it anyway. Though I like tofu and actually order it out in Asian restaurants quite frequently, it's not something I've yet attempted in my own kitchen. Though the book had a few tofu recipes, I took a different direction with the soy and selected a recipe with shelled edamame. We love edamame, having discovered it at a sushi restaurant years ago. We also love collard greens, occasionally picking up a batch to make with eggs on weekend mornings. The combination?! With bacon, onion, and BBQ sauce?! Delightful! You almost forget you're eating something so healthy! 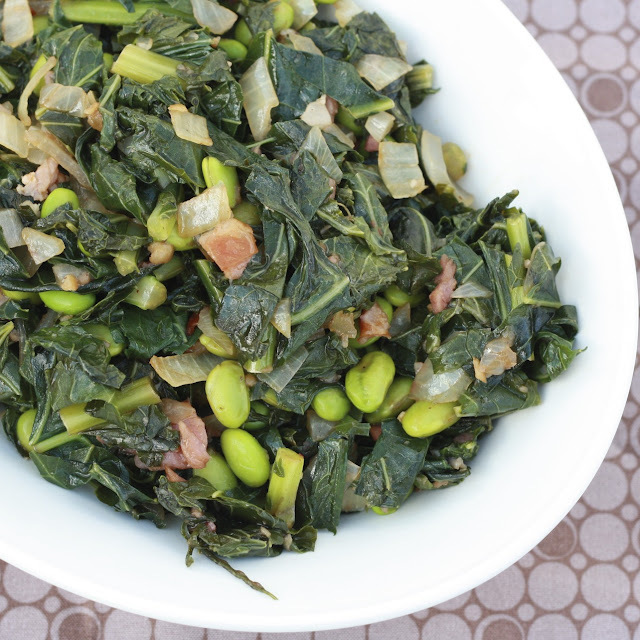 Adding edamame to my greens might be the new standard...both Ryan and I absolutely loved this side dish. Pair it with eggs or, as the book suggested, mix it up with some beans and rice for a complete meal. Two Years Ago: A glimpse into Ryan's Thanksgiving proposal! 1. Place the collard greens in a medium saucepan. Add 1/3 cup water, cover, and cook for 6 minutes over medium-high heat. 2. Add edamame, onion, and green pepper. Cover and cook for an additional 8 minutes. 3. Remove from heat. Stir in BBQ sauce and top with bacon. Serve immediately.